I hired Abstract Flooring to install a new Laminate Wood floor in my living room and downstairs toilet. As these areas are used daily it was important to me that the work was completed professionally and without blemish as I did not want to look at small errors or poor finish every day. The work has been completed well and on time to a reasonable price. I was happy with the choice of materials and prices offered. I was provided with options on finishing and was able to select the best for my taste. There are a number of quirks with my property which are natural for an old victorian house and Abstract were able to cope with these to provide a good finish. The site was left in a tidy and presentable state with excess waste taken off site by Abstract. I am happy with the work completed and would recommend or rehire Abstract in the future for this type of work. Mark was everything you would ask of a tradesman: reliable, trustworthy, hardworking, honest and pleasant. His workmanship was excellent.We went with the oak veneer flooring Mark recommended. It has been matched and laid thoughtfully so the wood pattern and colour look very natural. We required skirting boards as well as a new floor. These too were finished with great attention to detail. I have no hesitation in recommending Abstract Flooring to complete a super job. Mark has been brilliant at this job. We are very happy with our choice of flooring and the way it was fitted. Mark worked fast and he did a clean job. He also custom made the skirting boards with a modern design that we couldn't find in the shops. Highly recommended. I employed Abstract flooring to removed the carpet, underlay, grippers and skirtings and apply 2 coats of DPM, timber underlay and 18mm Solid Oak flooring and install new skirtings to our Lounge and connecting rear room, Throughout the install Mark was very professional and extremely tidy. Nothing was too much trouble, he even installed masking tape under the skirting so when I paint the paint would not get on the newly laid floor, the quality of the finish was first class and we are very pleased with the outcome. 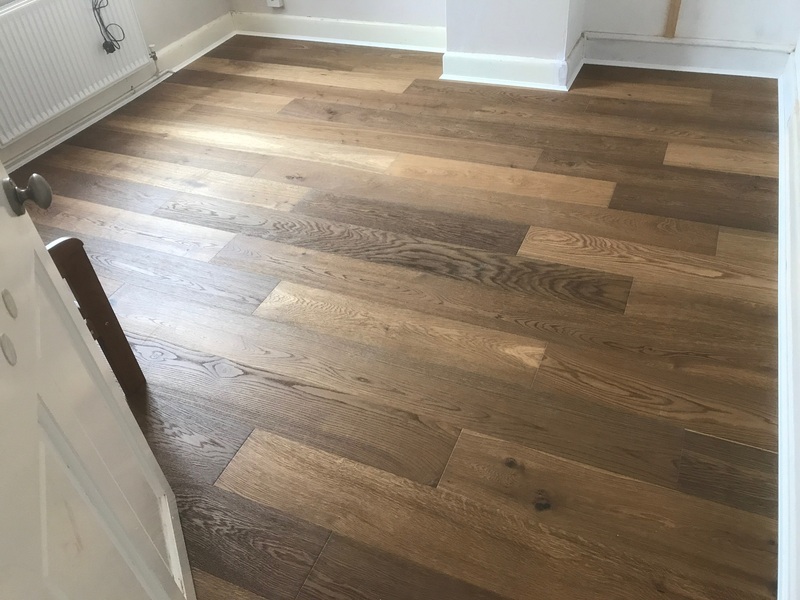 We will be using Abstract flooring to carry out further work in our house and would have no hesitation in recommending Mark to you and would suggest he is high on your list when choosing a timber flooring installer. Mark has been both professional on the job and a pleasant person to work without throughout the project. He took on a pretty big job with multiple aspects (tiling, wooden flooring, underfloor heating, and even ad-hoc bathroom fitting!) and has delivered a great result. We've been very happy with the work Mark has done and would recommend him to others. Mark was given the job of fitting the whole floor of our brand new large 5 bed home. He is a courteous and professional gentleman. He installed the whole ground floor with Quickstep's latest majestic floor, vinyl in the 4 bathrooms and installed a new carpet for the stairs and upper 2 floors. The ground floor included study, lounge, large kitchen, lounge hallway, utility and a toilet. So this is a reasonably big residential job. Having seen him work over a few days, I am very impressed with the quality of his work and attention to details. Equally important is that Mark will save you lots of money. I got my carpets and flooring at a good rate. His labour rate was also very reasonable. I have already taken pictures of his jobs to share, it's a shame that I cannot find any upload section on this feedback form. That is how impressed I am with his work. I am happy I gave him the job, most likely you will be too. I would wholeheartedly recommend Mark as a wood floor fitter. He's done an amazing job with laying engineered oak floor in our home, including two winding staircases, kitchen and other rooms. The quality of materials and workmanship were excellent, to the extent that other trade people, friends and even our postman complemented on them. Communication about the work, from planning, quotes to completion was great. Probably the cleanest tradesperson I've ever had in my home!